Young children easily fall in love with puppies, and that’s why Dalmatian party theme is extremely popular with kids. Throw a fantastic bash for the youngsters using the ideas below. Good luck! You can make your Dalmatian party invitations look like dog houses. Cut out rectangular shapes from white construction paper. Then cut out triangular shaped roofs from paper of different color. Write party information in the center. As an alternative, you can take blank invitation cards and place Dalmatian stickers all over them. Draw black spots on envelopes before mailing the invites. Lastly, you can have your invitations look like lost dog ads. You can write something like “Missing 101 Dalmatians. They are cute, friendly dogs. Last seen at (date and time of the party) at (address). Come help the owner (child’s name) find them. Call us at (phone number) to RSVP”, etc. Ask the kids to wear black and white clothing. Enlarge and laminate pictures of Dalmatian puppies. Glue sticks to the back of the images and scatter them around the yard placing them in the ground. Cut doggy “paw prints” out of black construction paper. Laminate and spread them all over the yard and inside the house. Enlarge a picture of fire hydrant and place it on the wall, along with other 101 Dalmatians theme posters. Try to get a hold of white balloons and streamers that have black Dalmatian spots on them. Otherwise, use an abundance of white and black decor items. (Have twice as many white accessories as you do black ones.) You can also paint black spots on white balloons, if you like. Spread out Dalmatian and other dog plush toys on the floor. Cover the table with black and white table cloth. Draw and laminate large bone shapes and put them on the table for place mats. Hang large “Happy Birthday” banner, and play 101 Dalmatians soundtrack. Welcome your little guests to the 101 Dalmatians party as they arrive. Give out dog ears and collars to every child. You can find these accessories at most party supplies outlets, or create them yourself. For dog ears, get headbands from a dollar store. Then glue on white felt ears with spots painted with fabric paint. *Puppy Transformations: Transform the kids into little Dalmatians. Get a face paint kit or use black marker. Draw a black round spot on children’s cheeks and color the tip of their noses. *Dog Tags: Provide paints, crayons and markers and get the kids to decorate their dog tags. They can draw dog bones, stars, flowers, or anything else they like. *Fun Pictures: When all the “puppies” have arrived, take a group photo. Send the pictures with you thank you cards after the party. Additionally, you can take pictures of guests one-on-one with the birthday child for a nice memento from the celebration. Fill favor bags with such cool Dalmatian birthday party favors as dog ears, mini bean bag dogs, whistles, theme sticker sheets, dog figurines, crayons, bone shaped cookies, and so on. The clues can say “A place where little kids play with bubbles.” (Answer: bathroom) or “I’m cold on the inside and run all day and all night” (Answer: refrigerator). Or, come up with your own clues that suit your surroundings. *Patch Says: Have a Dalmatian theme version of the “Simon Says” game. *Best Bark Contest: Here is a fun activity that fits the movie theme perfectly. One at a time, have the kids demonstrate their best puppy barks. Award prizes for the funniest, loudest, most real, silliest, etc. bark. Make sure that the contestants win one award each. *Puppy Toss: Spread terra cotta pots (or bowls) on the floor spaced at various distances away from each other. Have the kids toss beanbags or crumpled paper inside the pots for points. *Follow Patch: Pick one child to be Patch. Play some upbeat party music, and have the kid do silly dance moves as everyone else follows. Switch game leaders every 30 seconds or so, and continue with the activity until everyone had a chance to lead. *Fetch Relay: Divide the kids into 2 teams, and have them race on their all-fours like puppies. *Gelatin Eating Contest: Purchase inexpensive dog bowls from a dollar store. Prepare gelatin mix (one for each child) according to directions. Put gelatin into bowls. Spread newspapers or cloth on the ground and line up bowls with gelatin. Create name cards and place them at each “eating station.” Have the kids stand behind their bowls. On the command “Go”, they go down on their knees, put their hands on ground next to the bowl, and start eating their “dog food” without using their hands. The first child to clean his or her bowl, wins! 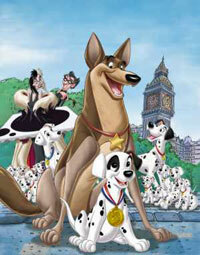 *101 Dalmatians Movie: At the end of the party, invite the kids to watch an episode from the show! Kids will absolutely love it if you serve all food in puppy bowls. *Dalmatian Cake: click on the link to review the cake recipe and additional dog theme food items. *Dalmatian Shakes: Combine 32 oz. of milk with 2 Oreo cookies and 3 scoops of vanilla ice cream. (For thicker shakes, add more ice cream.) Blend well. When serving, top with Oreo cookie crumbs.